AUSTRALIA: The federal government's decision to reject measures proposed by its chief scientist and come up with its own system has angered the country's long-suffering renewables sector. Australia's federal government has dropped the proposed clean energy target (CET) in a further blow to the renewables industry after years of indecision and deadlock. The government rejected the recommendation by chief scientist Alan Finkel to create a CET made during a review of Australia's energy sector in July. Finkel's report said the CET would allow all electricity generators to receive incentives based on the emissions produced and in a technology-neutral way. Finkel had suggested replacing the current federal renewable energy target (RET), which expires in 2020, with a CET. The RET aimed for 33TWh of renewable generation, after having been cut from the original 41TWh target in 2015. Instead, Malcolm Turnbull's coalition government has proposed another technology-neutral system by removing levels of support or tax, "creating a level playing field for all energy sources". "The guarantee is made up of two parts that together will require energy retailers and some large users across the national electricity market to deliver reliable and lower emissions energy generation each year," the government said in a statement. The two parts of the new arrangement include a "reliability guarantee" to ensure the correct level of "dispatchable energy... such as coal, gas, pumped hydro and batteries". The Australian Energy Market Commission and the Australian Energy Market Operator will set the level. The second promise is an "emissions guarantee" to "contribute to Australia's international commitments". "This two-part guarantee will deliver affordable and reliable energy for households and businesses without subsidies, taxes, emissions trading schemes or carbon prices," the government said. It hopes the new system will lower consumers' bills and reduce spot price volatility. In addition to the "guarantees", Turnbull's government has arranged a new package supporting the domestic supply of gas. Australia's renewables trade body, the Clean Energy Council (CEC), has heavily criticised the proposals, claiming the government has blown a golden opportunity to encourage renewables. It warned of another slowdown, similar to the one that crippled Australia's green energy growth in 2015 and 2016. "The federal government's decision to walk away from a CET is likely to result in a substantial slowdown in new clean-energy investment, meaning power prices will keep rising and voters will continue switching off," the CEC said. "The CET was the best opportunity in years to lock in the long-term bipartisan energy policy needed to encourage investment in cleaner energy while improving system reliability and pushing down power prices," said CEC chief executive Kane Thornton. "A company which is thinking about investing in a project worth hundreds of millions of dollars needs to have confidence the goal posts won't be moved halfway through the game," Thornton added. "We believe energy storage and demand management can provide much-improved reliability at times of high stress compared to the current system, but many people will be watching the final policy settings very closely. As an industry we will continue to push for the effective energy policy most Australians agree is urgently needed." Many of Australia's states have set their own renewable-energy targets in response to the years of uncertainty and lack of commitment by federal government. The opposition Labor party has set a target of 50% renewable energy. Shadow energy minister Mark Butler accused Turnbull of "turning his back" on renewables. In the same week as the Federal government's announcement, Victoria's state administration passed a law targeting 25% renewable energy by 2020, and 40% by 2025. South Australia this year hit its target of sourcing 50% of its energy from renewables - almost eight years ahead of schedule. After a series of blackouts, technology mogul Elon Musk offered to fix the state's energy system using a 100MW battery storage site. In August, Victoria announced a 650MW renewables auction and has passed a bill that enshrines RE targets in law. Two years earlier, it had vowed to set its own targets to restore investors' confidence after former prime minister Tony Abbott cut Australia's 2020 RET from 41TWh to 33TWh. The Northern Territory has no wind projects and currently relies on 60% natural gas, 30% imported diesel and "a limited amount of renewable energy". In June, the state government said it would invest A$1.16 billion in improving its energy system and reach its 50% target. Its roadmap includes provisions for a 400MW reverse auction, including 100MW of storage. Developer Windlab raised A$50 million for an up-to-1.2GW hybrid wind, solar and storage plant. AGL has won approval for the 453MW Coopers Gap wind farm. In 2016, renewables accounted for more than 13% of all electricity on the state's main electricity grid, with wind power the most widely used renewable-energy source. Developer Trustpower plans to build a hybrid project with 170MW wind and 80MW solar. To reach the target of 20% renewables by 2020, the state aims to attract investment, build community support and grow renewable-energy expertise. In 2016, 14% of NSW's electricity was sourced from renewables. Wind accounted for 18% of the renewables sourced, or just over 2.5% of the total. The ACT government sources wind power from out of state. It has awarded support for a total of 600MW of wind capacity to projects in Victoria and South Australia, which the government says will deliver about 50% of the territory's electricity supply by 2020. 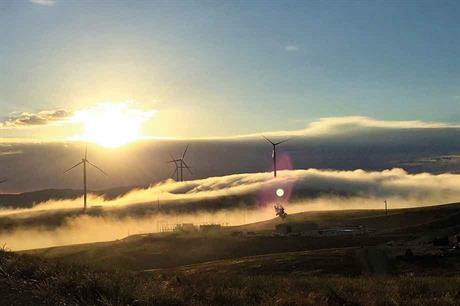 The state's first wind farm, the 214MW Collector project, is due online in 2020. At present, Tasmania sources 93% of its power from renewables, mainly hydro. It has 727MW of wind in the pipeline spread across five projects.